A youth exchange "Destroy prejudices, help Refugees" was held in Adana, Turkey from 30th of June to 8th of July 2017. 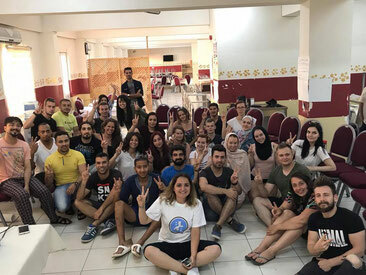 30 young people from Greece, turkey, Netherlands and Estonia joined non-formal learning activities to address topics of refugee situation in Turkey and Europe and prejudice around this topic. Aims of the project were to break down prejudice, stereotypes and fears of accepting and integrating refugees in our society. during the project, participants joined various activities like discussions, presentations, plenary, role plays, intercultural evenings, trips, visit of a refugee camp and other non-formal learning activities. To see photos of the project, click here.